Bede’s St John – less a healer, more a teacher? Those involved in Deaf history will know well the name of St John of Beverley. He was made famous by Bede, who wrote him into his 8th century Ecclesiastical History of the English Peoples, as a man who blessed and healed a deaf man, restoring him to health and to speech. Bede’s story of St John’s ‘miracle’ has taken on mythological status in histories of the Deaf community, and is regularly the first evidence that those histories offer of ‘attitudes towards deaf people’ on our (UK) shores. 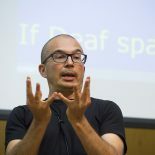 In those references, the idea of ‘healing’ deaf people is either applauded or condemned depending on whether it is used as an example of deaf people’s need for divine intervention, or an example of the kind of stories that those who believe in deaf people’s need for divine intervention might use to justify their own interventions. In the former case, the healing is believed to be real and a precursor to later, ‘good’, ‘healing-type’ work. In the latter case, it’s a made up story, and so a myth created to justify deaf people’s need for help. In either case – there’s never been any real challenge to the idea that Bede presents the ‘healing’ as… in fact, a ‘healing’. There was in a town not far off, a young man that was dumb, well known of the bishop (for he used to come before him oftentimes to receive his charity) who was never able to speak so much as one word…. This helpless man, the bishop commanded to be brought thither, and a place to be made for him within the precinct of his house, where he might ordinarily every day receive alms (food, clothes, or anything else he could get). And when one week of Lent was past, the next Sunday he willed the poor man to come into him : when he was come, he bid him put out his tongue and show it to him, and taking him by the chin, made the sign of the holy cross upon his tongue, and when he had so signed and blessed it, he commanded him to pull it in again, and said “Tell me one word… say geh, geh” which in the English tongue is a word that means the same as ‘yeh, yeh’. And the strings of his tongue were loosed, and he said that which he was commanded to say. The bishop added certain letters by name, and bid him say A : he said A. say B. he said B. and when he had said and recited after the bishop the whole alphabet, he moved onto syllables and whole words to be pronounced. And the man did so, correctly. And he commanded him to speak long sentences, and so he did. And the man did not then cease not all that day and night following, so long as he could hold up his head from sleep (as they make report that were present) to speak and declare his secret thoughts and purposes, which before that day he could never utter to any man. This reads so much like examples that I’ve read of 18th and 19th century oral/speech/articulation training (sound > syllable > word > phrase)… that I can’t help but think that the ‘healing’ was simply the man being taught, by a very careful tutor, to speak. In fact, the process described is almost exactly that used to teach the Frenchman Azy d’Etavigny to articulate in the 1700’s. And he was taught, by a similarly religious tutor, living out a semi-monastic life in a secluded Abbey, who based his approach on Konrad Amman’s C17th treatise on educating deaf people to speak. All of which makes me want to go back to Amman and see if he refers to Bede’s account as a possible template. I’m convinced, I think. In part, because this evidence and conclusion resolves a tension that we’ve seen coming up in our Victorian-period “Scripture, Dissent and Deaf Space” project between what we have understood the church to believe, and what we actually see them say. On the one hand, we knew that they were aware of Bede’s account. On the other, we find them stating clearly that deafness was something that couldn’t be healed in the here and now (2), and that the only person to have ever shown the opposite and healed a deaf man was Jesus (as God incarnate) himself (3). We’ve always glossed over this tension assuming that they somehow conveniently ‘forgot’ about Bede’s account, or relegated it to ‘myth’ because it was so long ago… but it might be more accurate to say that they knew about it, but didn’t include it as healing… because it wasn’t. So now, I wonder what this means for the well worn Deaf history trope of ‘healing’ – and the idea that much of what the church did, for good or evil (depending on where you sit), was motivated by a belief in physical, audiological healing, that went right back to St John. If this argument is convincing, then instead of challenging the idea that the Victorians and Bede had of ‘healing’ – we need to accept that they didn’t have that idea at all. Instead, we need to start asking where the assumption of their belief in healing got dropped into historical narratives by a much more recent historiography, and what it might mean to start trying to extract it. This entry was posted on October 21, 2016 by Mike Gulliver in Musings.